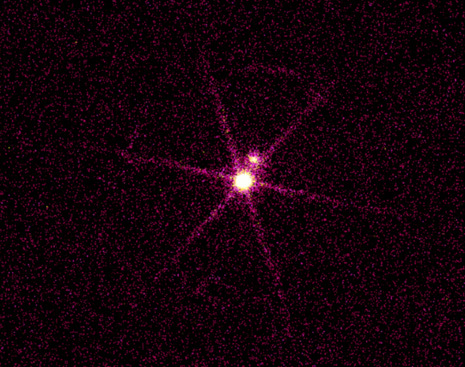 An X-ray image of the Sirius star system located 8.6 light years from Earth. This image shows two sources and a spike-like pattern due to the support structure for the transmission grating. The bright source is Sirius B, a white dwarf star that has a surface temperature of about 25,000 degrees Celsius which produces very low energy X-rays. 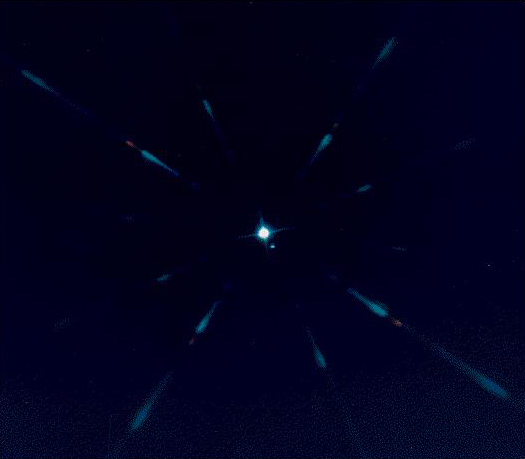 The dim source at the position of Sirius A – a normal star more than twice as massive as the Sun – may be due to ultraviolet radiation from Sirius A leaking through the filter on the detector. In contrast, Sirius A is the brightest star in the northern sky when viewed with an optical telescope, while Sirius B is 10,000 times dimmer. Because the two stars are so close together Sirius B escaped detection until 1862 when Alvan Clark discovered it while testing one of the best optical telescopes in the world at that time. The theory of white dwarf stars was developed by S. Chandrasekhar, the namesake of the Chandra X-ray Observatory. The story of Sirius B came full cycle when it was observed by Chandra in October 1999 during the calibration or test period. The white dwarf, Sirius B, has a mass equal to the mass of the Sun, packed into a diameter that is 90% that of the Earth. The gravity on the surface of Sirius B is 400,000 times that of Earth! Scale Image is 77 x 62 arcsec across. Coordinates (J2000) RA 06h 45m 11s | Dec -16° 42´ 05.00"